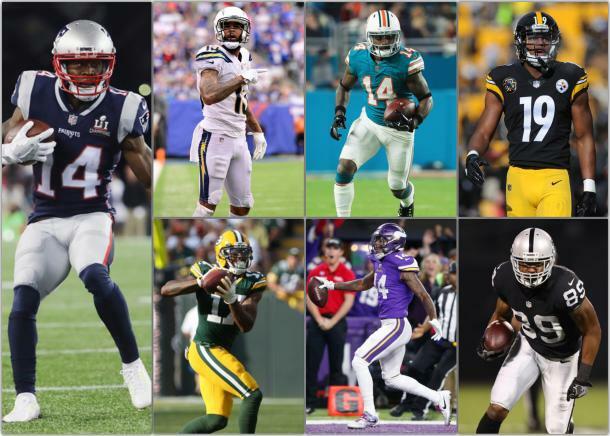 An early look at players who could lead the league in receiving. Last year was a very off year for Amari Cooper. Cooper was targeted 96 times and recorded 48 catches for just 680 yards. According to NBC Sports Copper managed to drop five passes all season but it felt a lot worse than that during the course of the season. 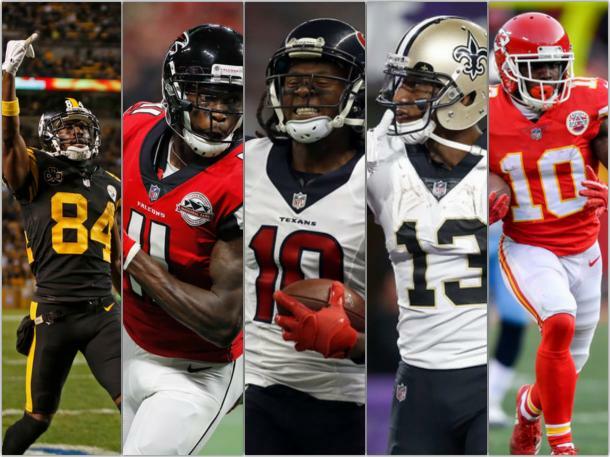 With Jordy Nelson and ​Martavis Bryant in the fold, less of the attention will be drawn away from Cooper, resulting in a possible rebound for the young star. Stefon Diggs delivered a solid season for the Minnesota Vikings. Finishing behind Adam Thielen on the team for receiving, Diggs still recorded 64 catches for 849 yards and eight touchdowns, tying for a team best. Diggs is a established receiver in the NFL, but 2018 could be his break out year. JuJu Smith-Schuster took the NFL by storm in 2017. The former USC product lead the NFL in receiving yards (917) and touchdowns (seven) for rookies. With quarterback Ben Roethlisberger has now developed a connection with the young wide out, Ben has another option to get the ball to when Antonio Brown isn't available to get the ball to. He will climb the ranks and possibly finish within the top-15. The Cleveland Browns traded for Jarvis Landry in the offseason in hopes of getting their offense going. Landry set a career high in receptions (112) and touchdowns (nine) in 2017 while recording 987 yards from scrimmage. Whether it be ​Baker Mayfield or Tyrod Taylor, they will have a reliable receiver to get the ball to. Landry could crack the top-15 in 2018. For 14 seasons, Larry Fitzgerald has been one of the best receivers in the NFL. In 2018, the soon to be 35-year-old will be playing in his 15th season. With three quarterbacks throwing him the ball last season, Fitzgerald managed to finish eighth in the NFL in yards (1,156) and second in receptions (109). 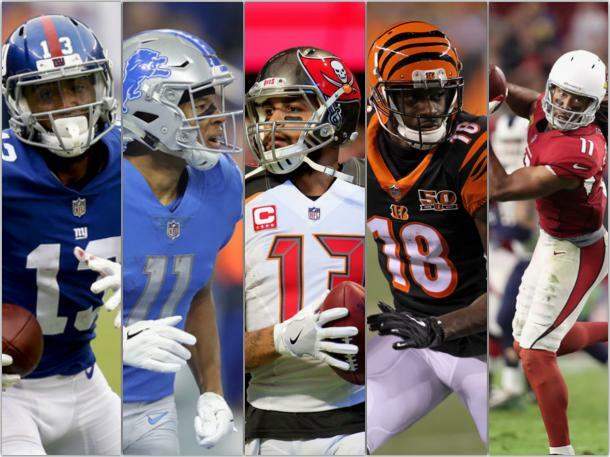 With Sam Bradford or Josh Rosen delivering the football to him in 2017 and showing no signs of slowing down for an older receiver, Fitzgerald can appear on the list of top receivers at seasons end in 2018. Hard to believe that A.J. Green will be playing in his eighth season in the NFL in 2018. Green quietly put together a solid 2018, finishing the season with 75 receptions for 1,078 yards and eight touchdowns. Green could again have himself a good season in 2018, with some players not coming up with the same production they had in 2017, finding himself in the top-10. You cannot teach tall wide receivers the skill set and abilities that Mike Evans possesses. In four years time, Evans has accumulated four 1,000 yard seasons and 32 touchdowns. Many thought that Evans had a down year in 2017, even though he totaled 71 receptions for 1,001 yards and five touchdowns. With a healthy James Winston, Evans should see how numbers increase and return to form in 2018. Since his arrival in Detroit, Marvin Jones has put together an impressive resume. It was his performance in 2017 that put him on the map. Jones caught 61 passes for 1,101 yards and nine touchdowns. Jones should have a similar type of season in 2018. The offense might change a little with the arrival of running backs LeGarrette Blount and Kerryon Johnson. Fellow receiver Golden Tate will also get his looks, with the possibility of him posting a 1,000 yards receiving. Odell Beckham has seen his ups and downs over the course of his four year career. From scoring 13 touchdowns to getting hit in the face by kicking nets, there have been plenty of reasons to talk about OBJ. In 2017, Beckham fractured his left ankle, playing in just four games and missing the remainder of the season. In 2018, Beckham enters the season in a contract year. He will have to put up impressive numbers if he want the New York Giants or any other team in the NFL to pay the figure he desires. Beckham could finish the season as one of the best receivers in the league.